Political prisoner Reza Joshan, incarcerated in ward 4, Hall 12 (security ward) of Rejaei shahr prison in Karaj has suffered a heart attack recently and is in a dire situation in detention. Despite the fact that on Wednesday 3rd of August, 26 years old Reza Joshan suffered a heart attack and collapsed, the authorities have not taken any specific measure to treat this political prisoners. According to reports by The Human Rights Activists For Democracy In Iran, following the heart attack which led to Reza Joshan suffering temporary stuttering, numbness in parts of his body, dizziness, nausea and vision problems, his life was saved by the prompt actions of his fellow inmates. This despite the fact that the officials were delaying transferring him to prison clinic, but with the persistent efforts and objections raised by his cellmates, Joshan was transferred to the clinic. However, after a short period of time in the clinic and only providing Joshan with aspirin tablets they returned him back to the isolation hall. It needs to be said that, currently, Reza Joshan continues to suffer from dizziness, weakness and nausea and must immediately be hospitalized. Human rights activist and banned from education, Kouhyar Goudarzi and his mother have been arrested. According to Jaras news site, so far officials have not released any information on the reason for arrest or the arresting agency for this mother and son. According to this report Kouhyar’s mother was arrested in Kerman (S.E. Iran) and may be detained in a detention center there. The report also indicates, It is not exactly known if Kouhyar is being held in Tehran or in Kerman. 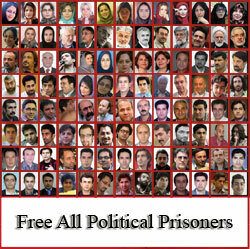 Kouhyar Goudarzi a member of the Committee For Human Rights Reporters was arrested post 2009 presidential election. He was in Evin prison for one year and was released after serving his sentence. Number of Goudarzi’s friends have indicated that reason for his arrest is his human rights activism and reason for his mothers’s arrest is her pursuing her son’s case while he was under arrest previously. These sources emphasized that Kouhyar’s mother, Parvin Mokhtare has had no prior political activities and only while her son was under arrest she pursued his case trying to obtain his freedom. Mrs Mokhtare was arrested once before in 2010 along with number of families of political prisoners protesting in front of Tehran Prosecutor’s office. She was detained for some hours and her cell phone was confiscated, but was released shortly after. According to this report, in the last few days, number of Kouhyar’s close friends have been summoned by security agencies in Tehran. As of date of this report, reason for arrest, their charges and the detention location of this mother and son are not known.